Longish, 35 hours of audio. But it feels short because it’s all fascinating. Tags: Business history, U.S. history, corruption, crony capitalism, free markets (or lack thereof), government regulation of commerce, monopoly, trust busting. You care about your integrity and are worried about crossing into gray areas in business. You want to understand how people can rationalize bad behavior. You’re interested in the intersection of government policy/regulation and business. You’re looking for evidence of how business corrupts government, or vice versa. 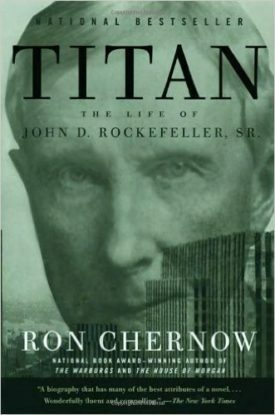 Almost 15 years ago one of my mentors told me “Money changes people.” In Ron Chernow’s biography of oil magnate John D. Rockefeller, Sr., as in “Yes, that Rockefeller,” he writes about how at one point Rockefeller stopped writing detailed letters to his wife about the business. At the same time Rockefeller was engaging in the outright illegal behavior, including the bribery of elected officials and other government bureaucrats. Was there a connection? Rockefeller was stoutly religious and saw himself as a righteous man. Unfortunately, it appears he held such a strict opinion of himself that he determined that whatever he did was right, no matter what it was. Much of Rockefeller’s behavior was labeled “anti-competitive” or just plain wrong by contemporaries, as well as the author who, I will admit, interjects more of his own opinion and judgment into the book than I would care for (I would prefer no judgment whatsoever). Some of the behavior Rockefeller participated in was arbitrarily “wrong,” that is, it was only wrong because the government said so, and in my opinion the government was in the wrong and I do not consider it dishonest to disobey an unjust law (whether it’s wise to disobey unjust laws is another matter). But what convinced me of Rockefeller’s lack of scruples was not that he engaged in illegal behavior, but that it appears he engaged in behavior which he himself would have labeled, under other circumstances, as being immoral. It’s one thing for a man to lie to the State, it’s another for him to lie to himself. Rockefeller hardly appears to have been the villain he is sometimes painted to be, but he certainly wasn’t innocent of wrongdoing. In fact, his behavior was perhaps worse than that of an outright criminal who knows he does wrong, since many of the greatest crimes of history have been committed not by those who knew they were doing wrong, but by those who thought they were doing right. This book is partly inspiring as an example of discipline and hustle, but also a warning that just because we believe we are right doesn’t make it so.